In 1963, a highly trained assassin known only as the Jackal is hired by a group of Frenchmen who want President Charles de Gaulle killed. While I don’t listen to Tony Kornheiser’s radio show for his movie reviews, I enjoy his observations, and they occasionally pique my interest. When I heard Kornheiser refer to 1973’s The Day of the Jackal as a “perfect movie”, that was enough for me. Time to break out the Blockbuster card and give it a rental! Adapted from the novel by Frederick Forsyth, the flick starts with a prologue that refers to French President Charles De Gaulle’s handling of Algeria in 1962. When he gives that nation their independence, a group of French extremists called the OAS plan to assassinate him. Their initial attempts fail miserably and leave the OAS in tatters. In a desperate move, OAS leaders decide to hire a foreign contract killer to slay De Gaulle for them. They settle on a mysterious Brit known to us only as “The Jackal” (Edward Fox). We follow his attempts to assassinate De Gaulle as well as the work by the French authorities to keep their leader alive and foil the plot. So was Kornheiser right? No, I wouldn’t agree that Jackal is a perfect movie, or even necessarily a great one. However, I do think it’s a very good film, and one that borders on excellence. It takes a fairly simple story and keeps us engrossed for almost two and a half hours. Going into Jackal, two plot points are obvious from the very start. For one, the Jackal won’t succeed. Since no one ever assassinated De Gaulle, the movie won’t change history. However, we know that the Jackal will almost achieve his goal. He’ll go through plenty of close calls but nothing that will prevent him from the near resolution of his assignment. Does the prior paragraph give away the ending of Jackal? Yes, but I regard those “revelations” as akin to a declaration that the Titanic sinks or Superman saves Lois Lane. The pleasure one takes from Jackal comes from the path it follows to get to its conclusion. We never doubt how the film will resolve, but we delight in the route it takes to get there. And Jackal follows an eminently delicious road to its conclusion. 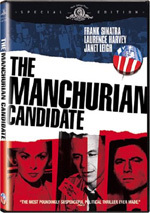 Director Fred Zinnemann doesn’t waste a shot in this exceedingly tight, concise flick. I don’t know of many other flicks that boast such precise plotting. You won’t find an extraneous scene here, as even when a sequence feels like a throwaway, its connection to the main story soon becomes clear. Jackal really is all about the plot. Exposition never arises, which I regard as a good thing. Of course, if we learned anything about the Jackal himself, that would mar the fun. I suppose some flicks might like to take a pop psychology approach to the role and show us what made him a cold-blooded assassin, but I think that approach would be out of place here. The Jackal’s anonymity gives him a cool sheen that would evaporate with any character background. The same goes for the other roles. We don’t learn much about the cops and others involved, and we don’t need any of that information. Jackal doesn’t bother with their home lives or their relationships unless they connect to the story. This makes it a focused tale without any flab whatsoever. I must admit I’m glad I never saw Jackal theatrically, as it’d be impossible to take a bathroom break. There’s no point in the film where you can spot an extraneous character bit and take a pee. You’d just have to hold it for all two and a half hours or risk missing a crucial plot element. This also means the flick never patronizes the viewer. It includes many small beats but it doesn’t spell them out for the audience. If you pick up on them, that’s great, but if you don’t, tough luck. The film won’t slow down its relentless pace to let you catch up; it doesn’t mollycoddle the inattentive. I love that fact, since it really does reward the viewer with many clever bits. I don’t think that this means you have to take notes while you watch Jackal; Zinnemann tells things in such a crisp, logical way that it becomes easy to remember the elements. It does mean that you need to grasp callbacks and quick references without warning, though, and – gasp! – you’ll actually have to think while you watch. In Jackal, Zinnemann loves to set up a premise and then ignore it for an extended period before it finally returns. The tightness with which it develops all the elements really delights. The flick doesn’t use convenient loopholes to develop the story; it ensures that when a twist occurs, we had preparation for it. Jackal also benefits from an understated storytelling style. Despite the literal life and death drama on display, Zinnemann doesn’t resort to histrionics or cheap methods to milk the tension. He lets the story do the work and allows things to unfold in an involving way. Some of the most dynamic editing I’ve ever seen helps. Actually, “dynamic” doesn’t sound right, as that implies an aggressive cutting style. Instead, Jackal features smooth transitions that lead us naturally from one sequence, place and/or character to another. That’s part of that “no bathroom break” factor; the flick zips from bit to bit in such a seamless manner that we never find any flab or slow spots. Like I said, I don’t regard The Day of the Jackal as a perfect movie, but I can’t find many flaws on display. It takes a potentially complicated story and breaks it down to its basics. The rendering allows us to remain engrossed from start to finish. 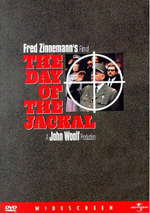 The Day of the Jackal appears in an aspect ratio of approximately 1.85:1 on this single-sided, double-layered DVD; the image has NOT been enhanced for 16X9 televisions. The disc hit the market early enough in the format’s existence that the lack of anamorphic enhancement didn’t come as a massive surprise, but it disappointed, nonetheless, and meant the picture came with a mix of concerns. Actually, sharpness wasn’t bad, and that side of things acted as a relative strength. “Relative” was the key concept, though, as definition faltered on occasion. Parts of the movie showed good delineation, but others became somewhat fuzzy, a factor exacerbated by some moderate edge enhancement. Despite the lack of anamorphic enhancement, shimmering and jagged edges caused no distractions, but source flaws were an issue. I noticed sporadic instances of specks, blotches, nicks and marks through this less than pristine print. Colors tended to be lackluster. Skin tones were usually ruddy, and the other hues were somewhat flat and bland. Blacks also seemed inky, while shadows seemed a bit thick and murky. All in all, this was a generally unappealing transfer, though not a terrible one. Jackal presented a monaural soundtrack that seemed perfectly acceptable for a film of its vintage. Audio quality was decent but not terribly good. Dialogue appeared fairly clear though it could be somewhat flat and lifeless. However, the lines remained consistently intelligible. Effects also sounded somewhat dull but were reasonably accurate, with little distortion. Music was a minor factor, as the flick lacked much score. When heard, the music resembled the other element; the score appeared constricted but clear. Overall, this was a passable mono mix for an early 1970s film. Only two minor extras accompany Jackal. In addition to the film’s theatrical trailer, we find some text Production Notes. These cover cast and crew as well as some shooting specifics. They don’t dig into things in detail, but they provide a decent overview. I’d like to say that they don’t make thrillers like The Day of the Jackal anymore, but I’m not sure they ever did. The movie resists any urges to dwell on extraneous story or character beats. It provides a tight, compelling drama without an ounce of fat. The DVD doesn’t fare as well, unfortunately. 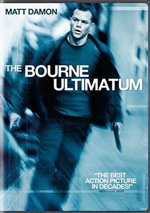 It offers lackluster picture, sound and extras. I like the film a lot, but this release disappoints.